When Prowler sees something he wants, there's not much you can do to keep it from him. At the start of each turn, fortify 2 enemy Strike, Attack, or Protect tiles. Whenever your team matches a Fortified enemy Strike, Attack, or Protect tile, Prowler steals that tile and improves it by 364. 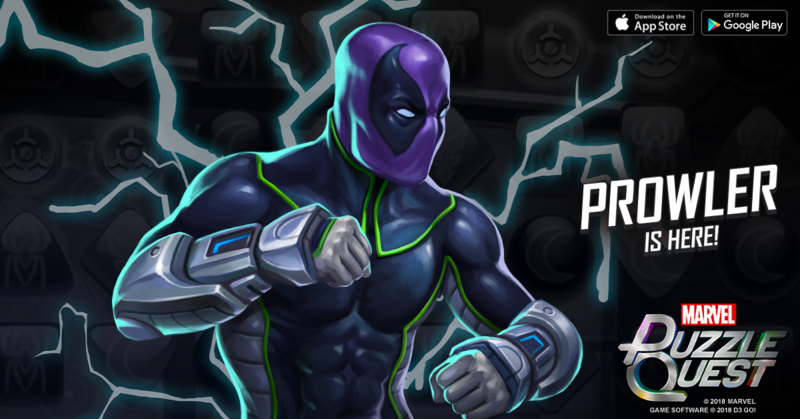 The Tinkerer's electrified gadgets pack a punch, but only if Prowler can figure out how to use them. Deals 3,737 damage and stuns the targeted enemy for 3 turns. If your team has more total Strike, Attack, or Protect tiles than the enemy team does, also deals 2,724 damage to all other enemies. When things get dicey, Prowler steals away, leaving his allies to clean up the mess. Creates 3 strength 256 friendly Strike tiles and 2 strength 126 enemy Strike tiles, then turns Prowler Invisible for 3 turns.